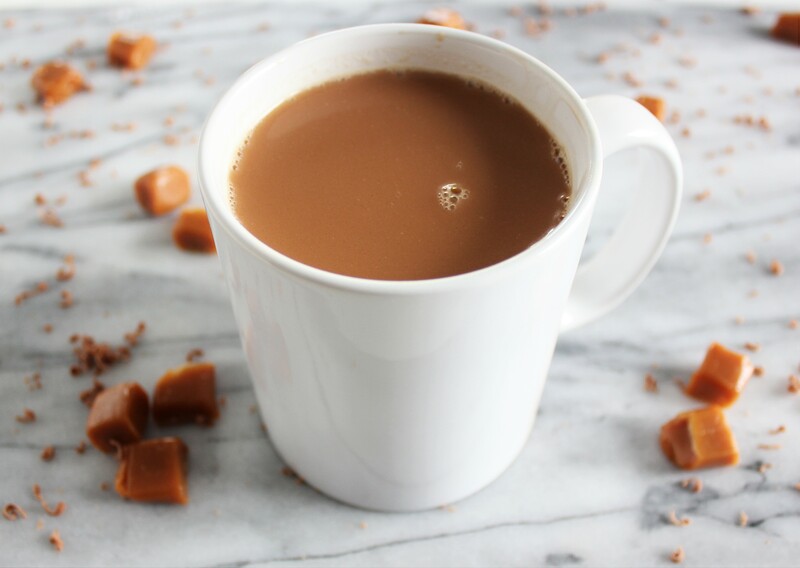 On a cold Fall day, treat yourself and indulge a little with some Slow Cooker Caramel Hot Chocolate. It’s rich, decadent and ridiculously easy! Halloween has come and gone, and I’m ready for all things Christmas! But before I get ahead of myself and start blabbing away about how excited I am, Fall is still here and I intend to take advantage of it. With the weather cooling down drastically and the sun setting earlier, all I crave is comforting salty foods and hot chocolate beverages. 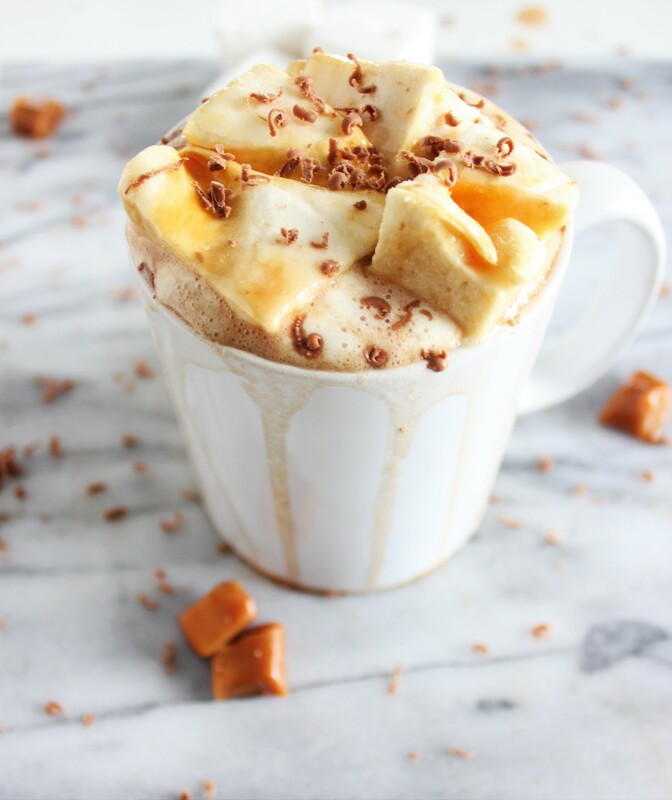 Today I’ll be sharing one of my most recent indulgences, slow cooker caramel hot chocolate. Now this isn’t your typical hot chocolate powder packs that you buy at the grocery store, although I admit that I am a little nostalgic about them because I grew up drinking it. Remember the ones with the little marshmallows already in it? Oh yeah, those were the days… This effortless decadent drink is made with a few ingredients- Vanilla, Lindt Milk Chocolate, Werther’s Original Soft Creme Caramels, and Natrel Fine Filtered 1% Milk. All of these ingredients can be found at Walmart, IGA or your other local grocery stores. 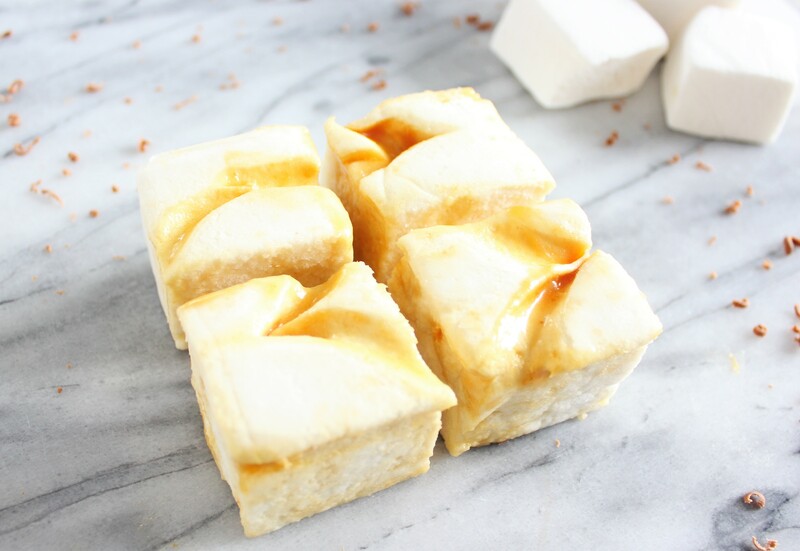 Now a hot chocolate recipe isn’t complete without some delicious toppings, and these Apple Caramel Marshmallows from GuimOv amped it up! GuimOv is a homemade confectionary and bakery located in Montreal that makes amazing flavors of marshmallows and buttery shortbread. 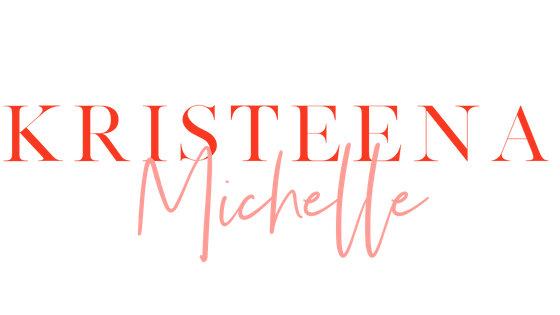 They do special orders for weddings, baby showers, birthdays, corporate events etc. Being that the holidays are fast approaching, it would be a great idea to create “hot chocolate in a jar” and gift them to your friends and family or throw a hot chocolate bar party. All the delicious possibilities are endless. 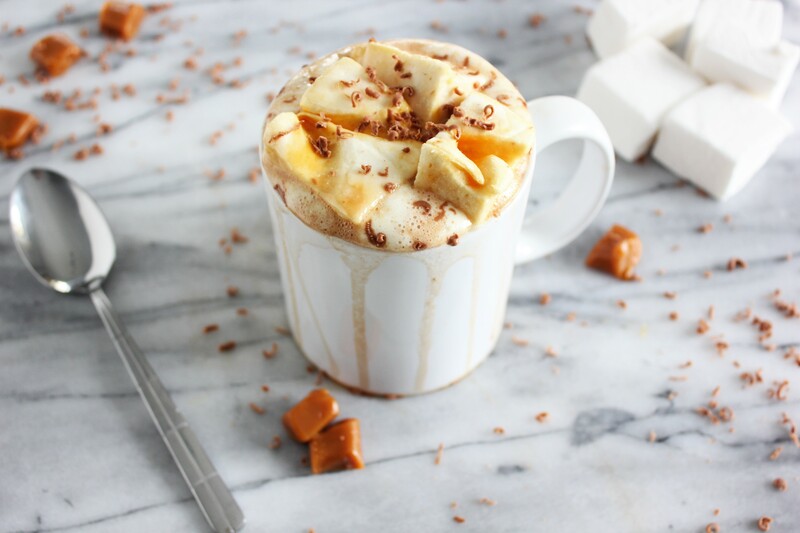 What I love about this recipe so much is that you can just dump everything in a crockpot and let it cook itself, come back a couple of hours later and you have yourself the most amazing caramel hot chocolate in your life! But that’s not all. Add 1/2 teaspoon of sea salt and you have a salted caramel hot chocolate. Did we just become best friends? YUP! 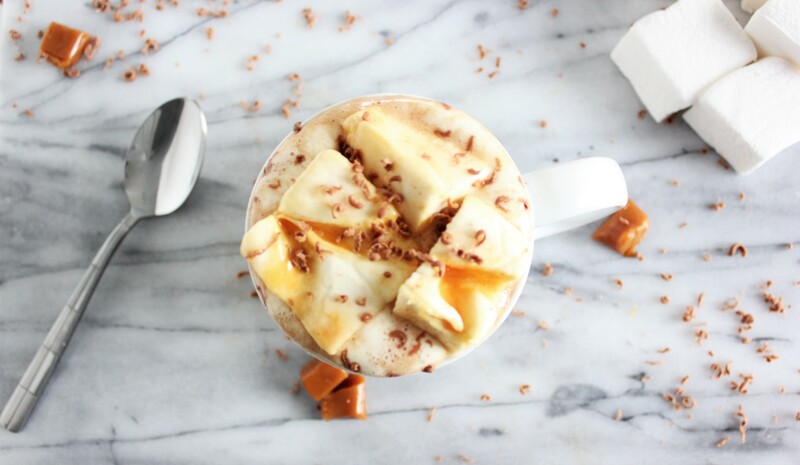 On a cold Fall day, treat yourself and indulge a little with some Slow Cooker Caramel Hot Chocolate. Rich, decadent and ridiculously easy! Add chocolate, caramels, milk and vanilla to the slow cooker. Cover and cook on low for 2 hours. Stir the hot chocolate. If the chocolate or caramels are not completely melted, cover and allow to cook for 15-25 minutes longer. Serve hot with marshmallows, whipped cream, chocolate shavings and/or caramel sauce if desired. What is your favorite warm drink? If you make this, let us see! Tag your photo with #MISyummyeats on Instagram.